Post-holiday returns are a reality for merchants of all shapes and sizes. Last year, UPS projected a whopping 1.4 million returns on what it dubbed “National Returns Day,” or January 3, 2018. That number represented roughly $90 billion in unwanted gifts, totaling to nearly a quarter of the year’s returns. As ecommerce gains momentum and consumers do more of their shopping online, returns are expected to increase, too. U.S. return deliveries are on track to cost $550 billion within the next two years—a gigantic 75% increase over 2016. Ecommerce returns will smash those numbers, increasing almost 95% over the last measured five-year period. Here are some tips for merchants to get a handle on post-holiday ecommerce returns to keep customers happy and chargebacks at bay. Having an easy-to-understand, fair return policy is essential. According to Shopify research, 67% of consumers will check a merchant’s return policy before buying and more than half are not satisfied with return policies or how returns need to be made. Offering a friction-free return policy can actually entice shoppers to buy from you. A great strategy is to offer a 30-day window for free returns. Customer service of this kind can actually be angled as a form of marketing, driving new business during an especially busy time of year. No matter what type of return policy you offer, be sure it is easily found on your website and can be read and understood in under a minute. This type of clarity is greatly appreciated by consumers and is likely to garner trust—and a purchase. A simple returns policy should be easily executed. By breaking down the entire return chain into smaller chunks, you can find ways to automate each of the steps, saving time and money. For example, figure out how to automate things like labels, tracking, and refunds. The less time you spend manually executing on any of those items, the more time you have to focus on the core business and ROI-generating activities. It’s also imperative to look for ways to save time during crunch time; Black Friday and Cyber Monday will bring swarms of customer into your store and onto your site. Spending time on shipping labels is best left to machines. Merchants should focus on great marketing and keeping customers happy during the buys holiday rush. Gift cards are an especially appealing refund option for merchants as they are able to keep the money allocated to their brand and improve cash flow. 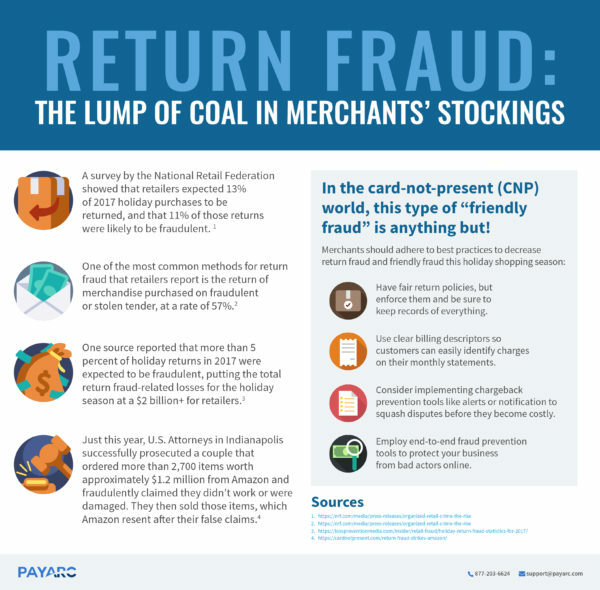 Streamlining post-holiday returns not only keeps customers happy and returning, but it can cut down on chargeback fraud. Sometimes, when ecommerce customers are dissatisfied with a return policy, they will claim they never received an item and dispute the charge with their issuing bank to receive a refund without dealing with the merchant. This circumvention costs merchants in shipping and merchandise as well as fines incurred from the chargeback. Providing a clear returns policy that supports automation on the merchant’s backend and flexibility on the consumer-facing side is a win-win. Merchants should conduct post-mortems after each holiday season to see what can improve and how previous years’ experience can inform future years’ policies and processes.